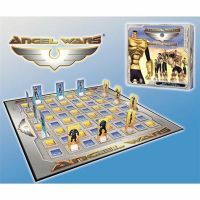 The Angel Wars Strategy Board Game is simple to learn but requires impressive strategy to win and master. The goal is to successfully travel across the board, while simultaneously keeping the opposing player from doing the same. This is a fun, interactive, stimulating activity that can be enjoyed for hours.